As fall approaches on The Outer Banks, and offshore swells pile buckets of flotsam and jetsam onto the shore, Hatteras Island becomes a beachcomber’s paradise. With less visitors to compete over the best finds, and miles of sand to explore, this is the time when dedicated hunters of shells and sea glass alike get up early, grab extra Food Lion bags for treasures, and head out on a pilgrimage to the beach. What can you expect to find? While each beachcomber has a secret catch that they love to collect best, the possibilities are virtually endless. Shells, shells, and more shells: Shell hunters have been flocking to Hatteras Island for years, and for good reason. The geographic exposure 30 miles into the Atlantic, frequent storms and swells, and gentle sandbars that leave shells in pristine condition combine to make these beaches one of the best for shelling. In fact, in 2007, adjacent Ocracoke Island won the #2 spot in Coastal Living’s “Best shell beaches in America” list. What can you expect to find? Be on the lookout for Scotch Bonnets, the local beachcomber’s most prized find. The North Carolina state shell is surprisingly uncommon, but can occasionally be spotted washed up along beaches with gentle surf. Larger waves bring moon snails, scallops, an assortment of clams, and three types of whelks: channel, knobbed and lightning. Don’t disregard the small stuff. Large gravelly piles of smaller shells often have tiny treasures, like long, spiral augers, margin shells, ornate oyster drills, and colorful coquinas: small clams that come in a rainbow of hues, from purple to brown and yellow stripes. Sea glass: The search for sea glass is gaining popularity as beachcombers love the jewel toned hues and versatility of these smooth, weathered down bits of glass. Perfect for clear lamps and ornamental vases, sea glass comes in a variety of colors, from blue to brown, but experienced hunters prize the rare red and orange pieces that occasionally find their way onto the beaches. Most shelling beaches are equally good sea glass beaches, but glass seekers may also want to take a trip to the sound, where a long walk can often yield fruitful results. The sound accesses in between Avon and Salvo are particularly good hunting grounds. Here, the original homes of the 1800s and 1900s are long gone, but little reminders still remain, like bits of sea glass, and sometimes old battered bottles in good condition. Driftwood: Crafty people love finding a smooth weather-worn piece of driftwood, as exceptional and unique pieces can make beautiful décor for beachy homes. If you find straight planks, the kind that most likely came from a ship, a sea-worthy frame is an easy project, as most hardware stores can provide you with custom sized pieces of glass. For more oddly shaped pieces, grab fishing line and seashells or sea glass with holes, and use the driftwood as a base for a wall-hanging. Everything and anything else: If shells, sea glass, and driftwood doesn’t suit you, don’t worry. On occasion, strong ocean waves can bring up far more interesting finds. People have collected sunglasses, kids’ beach toys, ancient brass ship bolts, and a number of oddities that somehow find their way to shore. 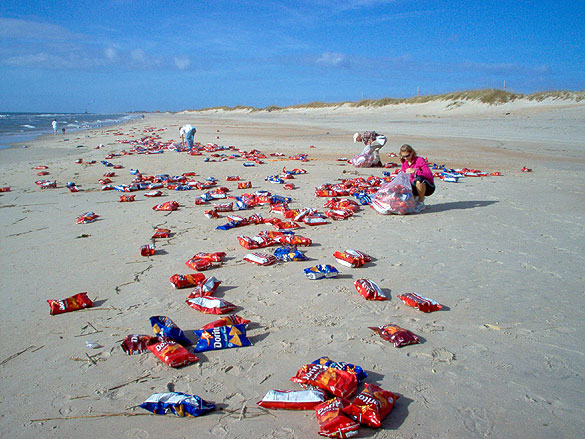 In 2007, a Frito Lays barge that was passing by dropped some of its cargo, and the beaches were covered with unspoiled, dry bags of Doritos. 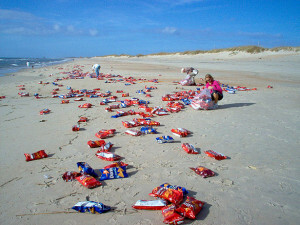 The lucky first arrivals went home with garbage bags filled to the brim with snack chips. Whether you’re on the hunt for that perfect seashell to brighten up a mantle, bits of sea glass for a colorful display, or bits and pieces of wood for a creative project, a nice early walk on the beach is sure to yield fruitful results. Head out early, don’t forget to look under seaweed patches, which can protect the more delicate specimens), and try to reach the beach just after a low or high tide. Regardless of what you find, the joy of a long beach walk is a treasure all in itself. Surf or Sound received a very thoughtful note from the guests of Scotch Retreat in Avon. Thank you to The Causgroves for the kind gesture! We are glad you enjoyed your stay and hope to see you next time you visit Hatteras Island!